extend your arms straight out from your sides and hold them there as long as you can. try to get to where you can lift a 100-lb potato bag in each hand and hold your arms straight for more than a full minute. 1-Where was the last known appearance of Country Music's star, Hank Williams, Sr.? 2-What famous actress/singer was born in Knoxville in 1930 and was the first woman to serve on the Board of Directors for the Singer Sewing Machine Company? "When riding your M/C or trike, do you prefer to ride?" about what your Chapter is doing to celebrate. It is now synergy green metallic. This is the same color as the 2011 Camero. My wife likes the fact that her red gear will not clash with it. As we were preparing to pack-up and head north after a winter in Florida, we received a phone call from our youngest daughter in Denver. The first words I heard were: "Daddy, can you help me?" After sitting down, she continued and said she was doing another Extreme Home Makeover show and needed her mother and me to come to Flagstaff, Arizona, and be the "gofers" for the show. Needless to say, we were so thrilled that it wasn't something tragic happening in her life that we agreed immediately (without much thought). The thought of traveling to Arizona from central Florida brought up two possible options: do we drive out in our truck, or make our first long trip on our trike? This was settled at our weekly "tire kicking" outing with our group. Do it while you are physically able, seemed to be the consensus of the group. Decision made... we ride the trike. We were only two days from departure so travel plans had to be made quickly. It was the initial plan to follow state routes and avoid interstate riding as much as possible. However, spring weather in the Midwest dictated otherwise. Tornadoes were being tracked through the very areas we had mapped out for the next week. This forced us to take I-75 and pick-up I-10 in northern Florida and head west. Our first stop was in Pensacola, Florida, due to a delayed start from home. The second night had us planning a stop just outside of Houston, Texas. A young man on a BMW, who we we were running into at various rest areas told us of an ideal place to stay. Good idea..., bad timing. The National Hot Rod Association Winter Nationals were taking place that week. No rooms until we were thirty miles west of town and pushing midnight. We survived the Houston ordeal and continued our venture across Texas with beautiful weather and tornadoes staying to our north. We did however learn about the high winds that frequent the southwest in the Spring. These winds shortened our day and we stopped in, Fort Stockton, Texas, where we ran into our Beemer friend and laughed about our rooms, or lack of, in Houston and these Texas winds. seen a trike before. This led to lots of questions and a very fascinating hour or so before bedtime in Lordsburg. Our next leg of our trip has us heading to Apache Junction, Arizona, to spend a day with my wife's brother and sister-in-law. A day of rest, then on to Flagstaff and the Home Makeover adventure. This show was to honor deceased war hero, Lori Piestawa. She was nominated for the home by Lori's best friend, former POW, Jessica Lynch, whose story of capture and near death dominated the first few weeks of the Iraq war. Our five days of participation was well-worth the trip out as we met some fascinating, and wonderful people donating their time and services to this project. One of the most memorable was after the house was completed and we were waiting in the VIP tent. Since Lori was a Hopi Indian, a veterans building was constructed on tribal grounds. Several members of the WWII code talkers were in attendance and we had the opportunity to spend an afternoon talking with them. Priceless! Since the threatening weather had passed, we traveled home avoiding interstates and saw a little bit more of the Midwest . 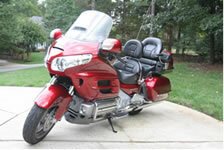 Our 1998 Goldwing performed flawlessly over the twenty-seven hundred miles of our trip. Thanks to our club members who insisted we do it while young enough. I was 70 and my wife 62. We have since taken our Wing from Ohio to Denver twice using route 36. Last summer some of us were traveling in Custer state Park in South Dakota, when we topped a hill and found a large herd of Buffalo coming toward us on the hill straddling the road. Not wanting to go back around the loop, I asked a man in a large pickup to drive through the herd and split it, clearing the highway. He agreed and I got on his rear bumper on my 1800 wing and we started through the herd. Not being from a farm enviroment, I did not know once the truck went through the buffalo, the herd would close in behind the truck. I could have kissed the big bulls on both sides of me. I started weaving the bike side to side and the herd parted clearing the road. For a few minutes I thought I was going to give up my wing and go for the back of the truck. Happy Anniversary everyone! It is astonishing to me that we are celebrating GWRRA's 34th anniversary this month. 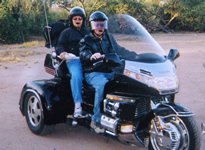 To realize that 34 years ago Paul had an idea and that he and Shirley and five other people met in a Denny's restaurant here in Phoenix to start what has become known as the Gold Wing Road Riders Association. 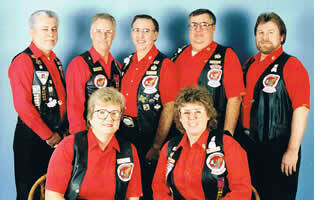 The world's largest, single marque, motorcycle association. Can you imagine that seven people in 1977, could imagine forming and starting such a social, family-friendly, FUN, knowledgeable, and life-saving organization? I am sure they did not! But the reality is, through Paul Hildebrand's vision and all the people who shared that vision along the way, including all the Officers and Volunteers who believed in him and the organization and each other, GWRRA has grown to over 72,000 Members in 55 countries. I remember becoming an Officer in 1980 and listening to him speak about the Vision and how he wanted to "Save Lives!" Now look at our award winning Rider Education Program! How many of you have been affected by it? 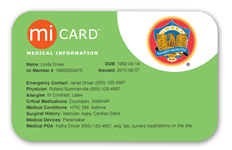 How many of you have had your lives saved by taking a rider course, a seminar, watching a video, etc.? As I told you previously, count me among one of those whose life has been saved by taking one of our ERC's! Thanks Paul, Shirley and everyone who has been apart of making this organization what it has become! Just a few more announcements. Remember that the end of this month marks the end of our Bundled Program Promotion. 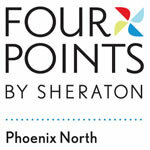 So, see the promo information on the mid-left side to get your Free Gift Certificates, if you qualify. Last month there was an error; as I mentioned an ad by EagleRider, but missed placing the ad. It is now at the bottom, left side of this e-Newsletter. And again, please support all of our advertisers, like J&M Corporation as they support us in keeping your Membership dues low and supporting GWRRA for many, many years. Another correction. GWRRA's anniversary was mentioned as June 7th in last months edition. It is actually, June 4th, 1977! My apologies. Two more reminders if I may. 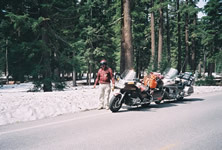 As our riding season is well upon us, make sure your machine and you are well prepared. Remember to get your bike serviced and this includes the little and big things. Everything from your fluids to your tires. And some forgotten items like the lug nuts on your rear tire...often forgotten. AND, Don't forget to prepare you, the rider and co-rider. Take that ERC class or co-rider seminar, for instance. Whatever you think you need to be totally prepared for riding season. Public Relations Director, from 1992-1994. BJ was also in the Hall of Fame, by recruiting over 100 Members and was emcee of many Talent Shows and Wing Dings over the years. Rest in peace BJ, you will be missed! And finally, I do want to extend a very hearty "THANK YOU" to all those folks who have sent in articles to be published. I received many more articles this month...keep them coming! Bowling Green, Kentucky, host city of the 2011 Trikes and Bikes Rally, is home to an American icon - the Chevrolet Corvette... America's first sports car. There's no other place in the world like the General Motors Corvette Assembly Plant in Bowling Green. The one million square foot structure - enough space for 22-football fields - sits on 212 acres and began production in 1981 when Corvettes were moved to Bowling Green from St. Louis. Since then, thousands of visitors have strolled through the one-hour tour and watched America's favorite sports car slowly emerge. First, the frame and body begin to take shape, then the engine and drive train merge, the windshields are attached, and finally in one of the most interesting phases of the tour, the chassis and body are joined. Each new car is run through a water tunnel to test for leaks, revved up on a stationary wheel and monitored on the plant's latest computerized equipment. To further add to Corvette's quality control, three of them are "audited" each morning when they are driven from the line and turned loose on the local roads and streets of Bowling Green for various stages of testing. Even though there are more than seven miles of conveyers that move the cars and parts in the building, the Corvette is still the star of the show. Once that engine is started and the motor growls, someone's dream is made. Every Corvette made at the GM Assembly Plant has been custom ordered either by the future owner or a specific dealer. The Assembly Plant was featured on National Geographic Channel's popular Ultimate Factories series in November 2007 and received the 2002 Kentucky Governor's Award for Industrial Leadership in Pollution Prevention. "The Corvette Plant has always been a big draw for Bowling Green," offered Vicki Fitch, Executive Director of the Bowling Green Area Convention & Visitors Bureau. "And now with tours being offered four times a day, we expect even more visitors to experience the American icon in the works." Plant tours are available at 8:30 a.m., 11:30 a.m., 12:45 p.m., and 2 p.m. Central Time, Monday through Thursday, except during model changes and holidays. Tours are also offered on certain Fridays when the Plant is in production. Admission is $7 and children under seven are not admitted. Reservations can be made online at www.bowlinggreenasssemblyplant.com or by calling 270-796-5063. For general information, phone 270-745-8287. Just � mile away from the GM Corvette Assembly Plant sits The National Corvette Museum, a museum unlike any other on earth. The exterior is immediately recognized by its space-age design, with sweeping lines that match the sports car it honors. Completely departing from the traditional rectangular museum concept, the Corvette showcase winds over an attractively landscaped 60-acre site featuring a large, circular car salon encased by a bright yellow cone-shaped roof. Above it soars a red, 12-story spire, visible for many miles and a landmark of the Bowling Green area. The interior of the 115,000-square-foot building uses curved walls, exciting geometric shapes and full-scale diorama sights and sounds to tell the past, present, and future story of the Corvette. More than 75 Corvettes of every era - some production and some one-of-a-kind concept vehicles - are displayed inside. The Museum debuted at its 15th Anniversary Celebration in 2009 a 47,000 square foot expansion that added an exhibit hall, Conference Center, Corvette Caf�, and an extensive Library and Archives. The tour begins in the 200-seat Chevrolet Theater with a brief introductory film blending the 50-year history of the legendary sports car with the mystique that sets it apart from all other automobiles. A nostalgia area houses the first exhibits with a series of realistic scenes mirroring the Corvette's early history. Continuing, the Route 66 tribute features a classic Corvette convertible and other stunning Corvettes that not only catch the eye, but also underscore the era's romance with the open highway. Next is a realistic Chevrolet dealer showroom from the 1960s. Visitors then enter an 80-foot diameter performance area, surrounded by a giant panoramic mural of famous Corvette racing scenes. This section is exclusively devoted to Corvette performance, one of the car's best-known accomplishments. Here visitors can interact and experience the excitement of the racing pits at the "Pit Crew Challenge" exhibit or take a test drive on one of two state-of-the-art driving simulators inside the Driving Simulation Theater. The visitor then advances to the design and development area to see how Corvettes are created at the General Motors Technical Center, and then it's on to the Enthusiasts Area where the true Corvette Lifestyle is celebrated. From here visitors enter the largest display area of the Museum, the Corvette Skydome, nearly 140 feet in diameter room and home to nearly 20 Corvettes and the Hall of Fame. Cars in this area, as in every part of the Museum, are constantly changing. The Exhibit Hall is the final display area in the Museum, housing an ever-changing display of specially-themed exhibits which rotate every few months. Rounding out the experience is the Corvette Store, a 4,600-square-foot retail store offering a wide variety of Corvette, Chevrolet and other automotive items. The Corvette Store gives way to Corvette Boulevard and the "Nursery" where visitors can watch new Corvette purchases come to life in the Delivery Area as owners take delivery of their new Corvette at the Museum. Throughout the Museum, figures from the Corvette's past and present help bring the exhibits to life. Learn about the men and women who are responsible for designing and engineering the car as well as those who raced the cars and made them famous. The Museum is open seven days a week from 8 a.m. to 5 p.m. except major holidays and tours are self-guided. Admission is $10 for adults, $8 for seniors and group rates are available. Call 800-53-VETTE or visit www.corvettemuseum.org for more information. The excitement, color and adventure that is the Corvette must be seen first-hand to be appreciated. After one visit to the GM Corvette Plant and the National Corvette Museum, you'll know why Bowling Green, KY is known across the world as Corvette City, USA. Your Chapter is out on a wonderful ride when all of a sudden you come upon an accident! So would your Members, including your self know what to do? Is your Chapter trained to take the appropriate course of action? After they attend this seminar they should be able to respond to any situation with both knowledge and confidence. I will highlight several actions and responsibilities that you will learn by taking the Motorcycle Accident Response Seminar. You will learn that a Trauma First Aid Kit is more useful than an ordinary small First Aid Kit because of the contents, especially scissors and gauze materials. Do you know that you will need the following personnel? Scene Coordinator, Traffic Control (front & rear), First Responders and a Communications person. Each one of these individuals have a very crucial responsibility. An accident, in itself, is a very traumatic experience. Therefore, we need to respond immediately and correctly in order to offer proper assistance. We need to stop as safely and quickly as possible and make sure we are out of harm's way. 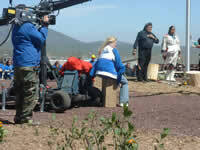 The Scene Coordinator which is the drag bike, will take charge and assign tasks as necessary. Remember, time is of the essence. Stay calm and cool and use the SET UP process. After the site is secured the scene coordinator will assist the First Responders in assessing the victims. Make sure the communications person has the necessary information to activate 911. Traffic Control will secure both ends of the road by placing themselves in a position to be both safe and visible. They should also be far enough away to protect the accident scene. Their job is to control traffic movement by taking charge and acting just as if they were a police official using the hand and arm signals you will learn in the seminar. First Responders will assess the scene, victims and injuries using the set up process. Making sure they check every person, vehicle and injury. If there are multiple victims then a triage site must be set up to determine who is the most critical. Priority has to take place before personal feelings. You should use the SAMPLE Method to obtain information from the victims if they are conscious and alert. Write everything down so you can keep it straight. Do not move anything at the scene. If something is moved, take a note that it was moved. If possible take picture of the scene. Give all of this to the EMS upon their arrival. Do not move the victim if head, neck or spinal injury is suspected. Only move the victim if absolutely necessary; begin treatment with the most serious. Continue treatment until EMS arrives. Assist EMS as directed. If not needed, get out of the way. Do not leave until released by authorities. When it is over everyone needs to go someplace and talk about what just happened. Check each other for shock. It is very important that you do not keep what just happened inside. Hopefully you will never have to deal with an accident scene. However, if you do, you will have the knowledge to do so. Until next time, ride safe and often, but never faster than your Guardian Angle can fly! Let us start by saying we hope everyone is safe from the storms that moved across the country during the past several weeks. With the riding season in full swing across most of the Association we are always concerned for the safety of our Members. As the riding season begins after a long winter season there is a considerable amount of debris that still remains on the roadways. Here in Virginia we still have lots of small gravel left on the road and especially in the medians and along the edges of the road. With the tremendous amount of snow and rainfall we have had during the winter and spring, there are continuous dangers of rock slides and other hazards. Please ride safe! By the time you are reading this article, Wing Ding 33 will be less than sixty days away. We would like to brief you on the STATISTICAL AWARDS and how to go about signing up for them. 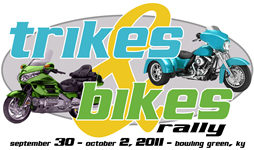 To be eligible for any Statistical Award, each person must currently be an Individual Member, Family Member, Individual Associate Member, or Family Associate Member of GWRRA and must have traveled to the event by motorcycle (not necessarily a Gold Wing or Valkyrie, and excluding "International Long Distance"). To be considered for a Statistical Award, you must sign up at the GWRRA Recruiting Booth in the Clinch Concourse in the Knoxville Convention Center. This can be done from 9 a.m. to 5 p.m. on Wednesday through Friday. Awards will be presented at 10 a.m. on Saturday, July 9, 2011. � A "Rider" is the person controlling a two-wheeled motorcycle, trike conversion, or motorcycle with a sidecar. � A "Co-Rider" is the person sitting behind the "Rider" of a two-wheeled motorcycle, trike conversion, or motorcycle with a sidecar. � A "Sidecar Passenger" is a person riding in a sidecar that is attached to a motorcycle. 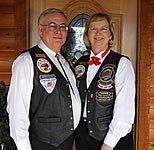 � The "Long Distance Rider/Couple" will be calculated using the most direct possible route from the Rider's home to the Wing Ding site in Knoxville, TN. This will be checked using a computer program. � The "International Long Distance" is for people who have traveled to the event, with or without a motorcycle, from another country. This will be calculated using the most direct possible route from the Rider's/delegate's home to the Wing Ding site in Knoxville, TN. This will be checked using a computer program. BE SURE TO STOP BY THE RECRUITING BOOTH AND SIGN UP! My wife "Gracie" and I have just returned from a birthday party for one of Chapter FL1-T Inverness, Florida participants. This social gathering of G.W.R.R.A. friends brought to mind the very essence of what our organization is all about: FAMILY. A while back I received a phone call from Larry Franklin, the Chapter Educator for Chapter FL2-R Fort Lauderdale, Florida. 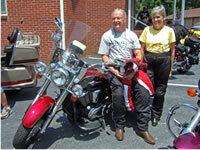 He explained that one of their Chapter participants, Howard Allen, had been in a motorcycle accident not too far from my home. Since FL2-R is quite a distance from the accident site, he asked if I could help in securing the bike from a local auto shop where it was being kept. Apparently, the auto shop was charging quite a bit for storage of the bike and Larry wasn't sure when he could pick it up and return it to Howard's wife. You see, while in a local hospital, Howard suffered a heart attack and passed away. The only person I could think of with a trailer to help me secure the bike was John Darbyson of FL1-T Inverness. He lives an hour from me but after receiving my call, immediately hooked up his trailer and came over. FAMILY. After we secured the bike in my garage, I thanked John and he said "No need to thank me, it's what we do." That say's it all as far as the overwhelming feeling of family helping family in the Gold Wing Road Riders Association. By the way, that birthday party "Gracie" and I attended was for John. You see, John Darbyson is eighty-five years old. Strange, when you're riding around, you happen to look over the edge of a roadway somewhere and catch a "Holy Cow, what was that?" glimpse of a rare and unusual sight. Most times, you'd ride on and reflect on it, like when spotting a bear in a field. Besides, ever since seeing that old guy get tossed by that Bison in that 'Animals Gone Wild' video, I'm not stopping for any live animal that can run faster than me. Other times, whatever it was, was so striking that you struggle to make the U-turn at the next wide spot in the road and return to the scene. This was the scenario when I first descended the long switchbacks leading into Castlegar, B.C. and spotted the abandoned Brilliant suspension bridge just outside of town by the airport. Approaching Castlegar by bike is a magnificent visual experience. The non-stop vistas over the Salmo-Creston pass to the east or the Blueberry-Paulson pass to the west, provide everything a tour bike or sport bike rider could hope for - wide, sweeping switchbacks and long, straight high plains with stretches of great road with minimal traffic. Now, membership in the male species comes with certain rights and obligations - one of which is an inherent interest in all things mechanical (tanks, bikes, old aircraft, old bridges) so this old derelict bridge, standing as proud as possible with both of its approaches knocked off, was fascinating. First of all, it was made of wood. Who ever heard of a suspension bridge made of wood? Sure, there were metal cable stringers, but the major structural components were concrete and wood, where you'd expect to see steel. 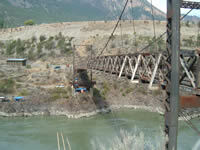 Historically, it was built by Dhoukobor (Russian immigrant) volunteer labourers in 1913 to span the Kootenay River. Considering that the Brooklyn (suspension) Bridge was constructed in 1883, the technology had already been in place for some time. Recent rebuilding has made it possible to get down the old highway to the bridge, although it has been presently open to foot and bicycle traffic only. Today's best view of this artefact is from the road running under the north side of the present Brilliant Bridge, which is just north of the Castlegar airport on Hwy 3A. 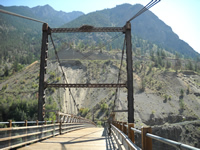 Lillooet, BC is usually tied with Lytton, BC with being the hottest spot in BC and is located at the eastern terminus of the legendary DuffyLake road on Hwy 99 just at the eastern lip of BC's inland desert. It has the look of a desert - sagebrush everywhere and it is pavement melting warm. Find a shady spot here overlooking the mighty Fraser River, while you listen to your bike make cooling noises, and smell the sage in the air. You can see two bridges, one of which resembles a dowager duchess at a high school dance. They had to refurbish the old bridge. It was in such bad shape in the latter days of daily use, the story goes, that a person watching a D-7 Cat crossing the bridge would watch it disappear from sight as it approached mid-span, as the bridge struggled to handle the weight. The diesel smoke billowing from the Cat's stack was the only evidence it hadn't crashed through the deck. Then the machine would slowly reappear as it crawled laboriously up to the safety of the other side like a giant yellow beetle. There was no way even a bike could make it across due to missing deck planking. Today, the deck has been replaced with fresh lumber and cables checked to support at least foot traffic and a second escape route from any more threatening scenarios...like, should Godzilla make an appearance. Motorcycle "Newbie": Adventure or Death Wish? In spite of the censure I expected from friends who are also in their mid-sixties, I finally did it: I bought a motorcycle. It wasn't an impulsive act, mind you, but a combination of recent experience as well as the rose-colored memories of forty-plus years ago. While in college in the 60s, I had a car and a friend had a 1949 Indian (remember suicide shifters?). He had a girl and I had a vacancy. So, he occasionally wanted a car to become "more expressive" with his girl, and I wanted to take his bike for a spin. Great trade, wouldn't you say? Advance forty-five years. While visiting my daughter and her husband in Rogers, AR, an unexpected miracle happened that caught me off guard. My son-in-law, a rabid Harley-Davidson motorcycle owner to whom I had asked many questions about his bike in several previous visits, suddenly asked me if I wanted to take his 1998 Softail Classic Heritage for a spin. My initial response was to get some ear cleaner and perhaps make an appointment with a hearing-aid specialist. Of course, I mumbled something that sounded like, "What?" He repeated the offer, and the next thing I knew, deja vu. I had his helmet on, the steed was spurred, and off we were. Instantly, I knew that my fond memories of biking were mingling with the joy of this new, open-road experience. After several miles on the back roads, chosen because I recognized the gap between my current skills and fond-though-superannuated memories, I reined in the mount, stopped in front of their house, and told my wife to get a helmet and saddle up. We spent about thirty exciting and wonderful minutes trekking the less-traveled roads, not wanting to return to the sedate routine at the ole homestead. The next day we were down to a motorcycle dealership Bentonville, AR, looking at cruisers and touring bikes. The bug had bitten, and I went right by the smaller bikes, convinced that my wife and I wanted to tour and needed a big and comfortable "highway lounge." Of course, the salesman saw my dilated pupils as I sat on the really-big touring bikes, all decked out for max comfort. But we showed great restraint, not wanting to rush into what I had determined would be my next escape from the mundane world of teaching, grading papers, and consulting. We returned home to North Carolina, which is the number four state for registered motorcycles, thanks to its great climate and many mountain and coastal roads. I then did what most of newbies do: read the motorcycle reviews, asked questions on the various cycle forums, and read some more. I must have hit almost every biker Web site in existence, looking for information that would help me decide upon a bike. I was a newbie, but I also had once owned and rode a Ducati 125 Mustang. So perhaps an "intermediate-level" bike would suit me best. By the time I was ready to make my bike-purchasing decision, I was firmly convinced that I was a death-wish fool for wanting to return to biking. After all, one little piece of advice really caught my attention: take the attitude that everyone driving out there wants to kill you. Ah, are people who want to bike secretly harboring a wish to die quickly--and soon? In spite of the scattered remarks about how fun and exhilarating motorcycling is, you will, according to the published experts, sooner or later suffer "road rash," disfiguration, and perhaps great pain. If you wear the safety gear all of the time, however, you will come through most mishaps with only minor damage. Of course, wearing all the safety gear has a tendency to make you look like the Michelin man on steroids. Quite intimidating. But life is choices, and I was convinced that I wanted a bike to offer me some adventuresome recompense for the routine course my life had taken. So I did it. I heeded the advice not to go for the biggest bikes, which require more skill in riding techniques than someone at my level of experience could quickly apply (and live to talk about it). I also decided that I didn't want to get a "beginner's" bike that would be underpowered and which would lose its appeal as my skills improved. A "small bike" also would not accommodate those long weekend trips my wife and I envisioned in the relatively-close future. 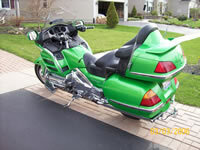 Hence, I decided upon a V-twin cruiser-not too small nor big. After all, I still wasn't sure that the reality of biking would be comparable to the dreams. Anxiety and great apprehension did not accompany my choice of bikes and putting a deposit down; it arose mightily as the days clicked off and came closer to the time I was going to pick up my bike and ride it home. Could I do it? Should I wait a week until I had finished the Motorcycle Safety Foundation riding skills course and then pick it up? Sleep was restless as I went through, over and over, the information in the Motorcycle Safety Foundation manual and a dozen other texts about hazards, avoidance techniques, which foot to put on the ground first while stopping, and the life-saving left- and right-hand head swivels to check for traffic. Am I too old? Do I have a will? Does anyone owe me some money? The day before I picked up the bike, I took the DMV written test and eye test. While talking to the DMV examiner, I began asking him questions about his own biking, safety clothing, and other cycle-related things. He stated that your attitude will determine what you do to ensure your safety--solid advice. He then asked me what kind of motorcyclist I envisioned myself as being, and I responded, "Alive." Funny how my worries kind of crystallized at that moment. Thursday arrived, and my bike was ready for me. As my wife drove me to the place, she kept asking me if I was sure that I wanted to hit the road with my new bike (not literally, of course). I told her that I had thought about paying a delivery service to bring the bike to my doorstep, but discarded that option when I thought more about why I was getting the bike. I couldn't learn by just reading books and watching videos, so I knew that I had to rely on my common sense and drive MY bike home, via the back roads. The trip home was a combination of joy, exhilaration, and anxiety. If X happened ahead, what would/should I do? When should I enter a right-hand-turn lane? My techniques became smoother as my vision cleared and I assumed a more reasonable yet still alert perspective. I pulled into my driveway, sweating in my new safety gear, but quite pleased that my bike and I had made it home in original-equipment condition. 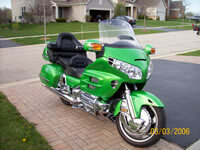 Several months ago, I traded in my cruiser for a 2008 Gold Wing Airbag. The time had come (14,000 miles worth) to enjoy the comforts of a first-class touring bike. I have not been disappointed: The smoothness, stability, and maneuverability of the 1800 make it a joy to ride. No small matter is the comfort my wife enjoys in the back seat. I shall continue to learn, practice, and yet enjoy the experience of biking as each day goes by, never becoming complacent, always vigilant, and very happy that I took a wish out of the bucket and am enjoying it now. Carpe diem! Special 4 DVD package pricing. Includes all 4 instructional DVD's.